The future for America’s shipments of lethal weapons to Ukraine is not yet clear. However, the current situation there is distinctly reminiscent of another conflict from 20 years ago – the Bosnian War – during which the United States and NATO worked actively to arm one side, eventually leading to tremendous bloodshed. 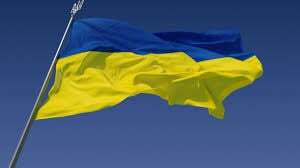 Recently, former NATO Supreme Allied Commander Gen. Wesley Clark stated that the US should arm Ukraine in order to avoid massive bloodshed there. But Clark is obviously being disingenuous. In fact, it was the American decision to recognize Bosnia-Herzegovina’s independence from Belgrade on April 7, 1992 that triggered the sharp deterioration of the situation in the Balkans. Afterward, the Serbs (the Republic of Serbia) announced that they did not recognize the authority of the US- and EU-leaning central Muslim government of Bosnia-Herzegovina (BiH), and they began to form their own army, recruited from the garrisons of the Yugoslav Army inside Bosnia-Herzegovina. 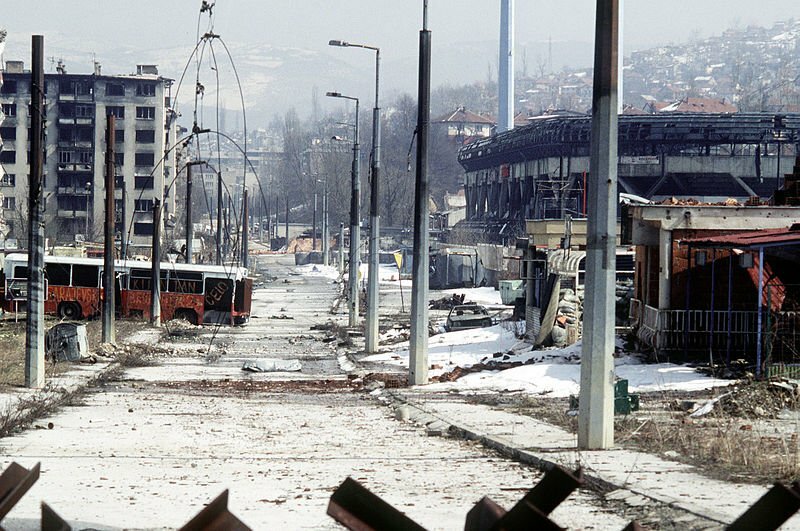 By April 1992, major military operations had already been launched between the Serbs and the Bosnian Muslims, which resulted in the destruction of most of the cities in BiH, including Sarajevo. The West laid the blame for the escalation of the conflict on the Bosnian Serbs, who – according to the United States – were being supported by the Yugoslav leader, Slobodan Milošević. 1) Through Croatian ports on the Adriatic Sea and then onward through Croatia into Bosnia-Herzegovina. 2) By land, in the guise of humanitarian aid from the EU. 3) By air, using NATO military transport aircraft. 4) From Albania through Kosovo under the watchful eye of the US while that region began its transformation into the major hub for drugs and weapons that it is today. 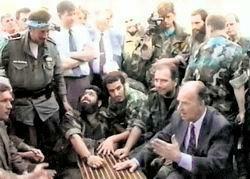 Bosnian Muslim President Alija Izetbegovic, lower right, meeting with Al-Qaeda linked Arab-Afghan mujahedeen in Bosnia. Saudi Arabia was one of the biggest arms suppliers operating through Kosovo. Throughout the crisis, which lasted several years, weapons continuously entered Bosnia. In 1993 alone, according to the Washington Post, America’s allies, including Saudi Arabia, shipped $300 million worth of armaments into Bosnia. Meanwhile, back in July 1993 the government of Yugoslavia had told the UN about major arms shipments being delivered to the Bosnian Muslims from NATO countries (Austria and Germany – from the former military warehouses of the GDR), as well as from Hungary, Switzerland, and many other countries. The US ambassador to Croatia at that time, Peter Galbraith, was forced to admit that his country was closing eyes on violations of the international embargo for arms shipments to Bosnia. US Air Force F-16C Fighting Falcon aircraft of the 31st Fighter Wing landing upon returning from a mission in support of NATO airstrikes against the Bosnian Serbs. 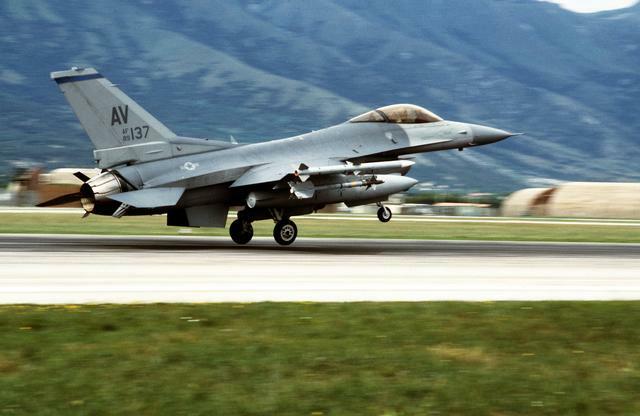 In addition to undisguised shipments of military equipment, in early 1995 the US Air Force took on a direct role in the military operations against the Bosnian Serbs. NATO aircraft began to patrol the country’s airspace. The situation culminated in NATO’s Operation Deliberate Force, lasting from Aug. 30 – Sept. 20, 1995, during which American aircraft attacked not only military targets in the Republic of Serbia, but also the civilian infrastructure. America’s overt intervention in the war led to the signing of agreements reached at a US military base, under which much land that was historically Serbian was handed over to the Bosnian Muslims, prompting a huge influx of refugees across the border into Serbia. Thus, the weapons provided by NATO in order to bring about “peace as soon as possible” in Bosnia, led not to a resolution of the situation, but to a sharp escalation of the conflict. The weaponry fed to the Bosnian army was the trigger that sparked over three years of armed hostilities. This led to 150,000-200,000 deaths and the devastation of both the infrastructure as well as the system of vital social services throughout the country.